Are you interested in planting herbs that attract bees to your property? Bee-friendly herbs are not only fun to grow, but seeing the bees come into your garden to pollinate them is so cool. I love watching the bees work when they come to enjoy the bee-friendly herbs I’ve placed in my garden just for them. As a beekeeper and gardener myself, I have seen the benefits and positive changes in my vegetable crops thanks to the bees. My yields and quality of the produce has been outstanding since I started keeping bees. And I want you to have the results I’ve seen. Planting herbs that attract bees will not only attract more bees into your gardens and yard, but they are good for you as well. Some herbs are medicinal while others taste delicious. Luckily, there are numerous options for you when it comes to planting herbs that attract bees. Bee-friendly herbs you can plant today along with some care tips for each one. Also, herbs that repel bees, just so you know what they are. DISCLOSURE: THIS Planting Herbs that Attract Bees POST CONTAINS AFFILIATE LINKS. THIS MEANS THAT, AT NO ADDITIONAL COST TO YOU, I MAY GET A COMMISSION IF YOU CLICK THE LINK AND MAKE A PURCHASE. THANKS FOR YOUR SUPPORT IN THIS WAY! Angelica – This herb is as sweet as it’s name. It’s widely known and popular herb as a flavoring in the confectionery world and also for liquors. If you’ve ever tasted a sweet liquor, chances are you’ve tasted angelica. No wonder it’s one of the most popular bee-friendly herbs to grow! In addition, angelica is very commonly used in recipes for jams, sweet breads and infused sweet drinks. Also, if you have an earwig problem in your garden, you can use angelica as bait to trap them. So, bees are attracted to this sweet smelling herb. It’s pale, yellow oblong fruits contain medicinal benefits for us as well. You can use angelica to treat the common cold and infections. These planting herbs that attract bees can be very beneficial to grow for your own health as well. Anise Hyssop – This pretty woody plant blooms lavender, white, pink and blue flowers. So, it’s no wonder bees are attracted to the vibrant colors of these bee-friendly herbs. Not only do we love these as planting herbs that attract bees, but for our own health and wellness as well. It also makes a beautiful garnish on our plates at restaurants. Not only is it delicious to taste infused in tea, but it does have some medicinal benefits as well. Anise Hyssop is a relaxing herb, used to soothe sore muscles or relieve bad dreams. I love using this herb when I’m sore after heavy lifting on the farm or at the gym. If you want to know why I LOVE the gym and go regularly, click here. Basil – We all know and love this herb in our spaghetti sauces, pizza and salsas. But did you know that it reduces inflamation and is rich in antioxidants? That certainly makes me want to eat more of it! Better yet, it has lots of anti-aging and antibacterial properties. So, it keeps us looking young AND helps keep us healthy, too. What’s not to like? Of course, we know that basil is so easy to grow. But do bees like basil? It’s a member of the mint family so you can grow it with just about anything else. Plus, it’s fragrance attracts bees to your garden daily. For suggestions about other plants that grow great with basil, go here. Bee Balm (Bergamot) – Remember the Boston Tea Party? When the angry colonists through the taxed English tea overboard into the waters of Boston Harbor, they still wanted tasty tea. So, they used bee balm to infuse a tea that was both medicinally beneficial and tasty. Bee balm is great for reducing fevers, soothing sore throats and respiratory ailments. You can also make bee balm jelly, a cough suppressant with vinegar, bee balm and honey and a tincture with vodka! Finally, bee balm has beautiful bright flowers that are very fragrant making these wonderful bee-friendly herbs great to have in your garden. This makes it great for use as a garnish to make every plate and centerpiece beautiful. Betony – If you believe in magic, you should try Betony sometime. When planting herbs that attract bees, you’re going to want to include these bee-friendly herbs into the mix. This hardy Perennial herb grows in temperate woods and is known to have wide-spread magical benefits. You also have to understand, though, that this magic is slow-acting. It’s not going to happen immediately. Ok, so the magic that betony provides includes: Headache relief and improvement for your mental health in general. Thus, it makes you happy. I don’t currently grow this one, but I think I need to have it on hand for the winter months. For more information on cures for Winter Blues, go here. Borage – These pretty bee-friendly herbs are recognized by the big star flower it produces. But we love it because it may help regulate our hormones. The seeds in the flower contains an oil rich in Omega Fatty Acids, which we know are very healthy fats. It’s also a very useful remedy in colds, coughs and respiratory ailments. Please note that this herb must be used with caution and in moderation. It is very potent and definitely shouldn’t be used while pregnant as it’s been known as a possible cause for abortions. Chamomile – A common one of those bee-friendly herbs, I love chamomile tea. I grow lots of chamomile and then dry the flowers to infuse later. And we all know that planting herbs that attract bees give us medicinal benefits to enjoy ourselves. The biggest benefit to chamomile is that it is calming and relaxing, relieving stress from the day. What’s not to love about that? But did you know that it also cures pain, inflamation, allergies and digestive issues? Another thing I didn’t know about chamomile is that it’s widely used in self-care products, such as deodorants, shampoos and perfumes. Here’s some great products recommended by others that I now recommend for you to buy and try. Here’s a chamomile deodorant to start smelling sweeter. Shop here for chamomile shampoo. Check out chamomile perfume here and start smelling sweeter. Chicory – If you’re a coffee drinker, you might be especially interested in this one. Who know that planting herbs that attract bees could also include an energy boost? Chickory does NOT contain caffeine but it is used as a coffee substitute because of it’s amazing caffeine-like properties. Yes! Sign me up! It does have some sedative and relaxing side effects and it also protects the liver. Healthy coffee – Who knew? And also another one of those bee-friendly herbs. And bees love it, too. Chicory plants produce blue or lavender flowers that keep bees coming back for more. If you must find chicory for your caffeine-less energy boost, go here. Dandelion – Not really an herb, but used more and more for seasoning and eating. So, I’m going to call it an herb today. Dandelion is most definitely another one of those bee-friendly herbs I’ve been talking about. Dandelions grow naturally here and are my bee’s first food in the spring. Yes, I let dandelions grow out in my yard for my bees. In the spring, my yard is full of bees enjoying the dandelions. I love watching them work their magic. Did you know that dandelions actually contain some health benefits for you and me? Some of these include relief for urinary disorders, bone health, detox and skin care. Dandelion flowers and leaves are rich in vitamins, iron, and calcium. Which explains why it’s being used more and more in the culinary world. Another great way to try it as a food is spring greens as a salad. Who knew a weed that has transformed into planting herbs that attract bees could taste so amazing? Dill – I’m a huge fan of dill pickles. So, I enjoy planting herbs that attract bees, which includes dill! But did you know that dill has amazing medicinal benefits as well? These include relief for cramping, depression, lowering cholesterol, repelling mosquitos, anti-inflammatory among others. It’s known to be very calming and soothing. And it’s been here a long time. History tells us that the Puritans brought it over when they came to America in the 1600’s. Seeds are commonly used in pickling and leaves in other dishes. It’s a feathery delicate green annual that produces big yellow flowers, which bees appreciate very much. Germander – Produces big lavender and purple flowers, germander is a very low-maintenance herb. It’s pretty flowers are commonly dried and used for crafts and colorful wreaths. They are also infused into teas or water to help with gout. Germander also has respiratory healing properties when infused with honey and made into cough drops or cough syrups. It’s also widely used as a flavoring in alcoholic beverages and used as a mouth wash to freshen breath. Fennel – Bees love the smell of fresh fennel and some say it has a licorice-like flavor. But there’s more to this herb than just being another one of those bee-friendly herbs. All parts of the plant are edible from the bulb to the top of the long green stalks. It’s used to flavor lots of different types of dishes. People also use it for weight loss management, bone health, reducing blood pressure, heart health, and inflammation. Consider fennel as planting herbs that attract bees but also for your health as well. Feverfew – Bees love the white flower with the yellow center. And there’s also lots of health benefits with feverfew as well. These include headache relief, allergy relief, dizziness, nausea, and toothaches. You might not know that a common name for feverfew is Bachelor Buttons. I certainly did not know this until I started looking harder for information about this herb. The funny thing is that my mother has always grown bachelor buttons, which means we’ve always had fevorfew around. 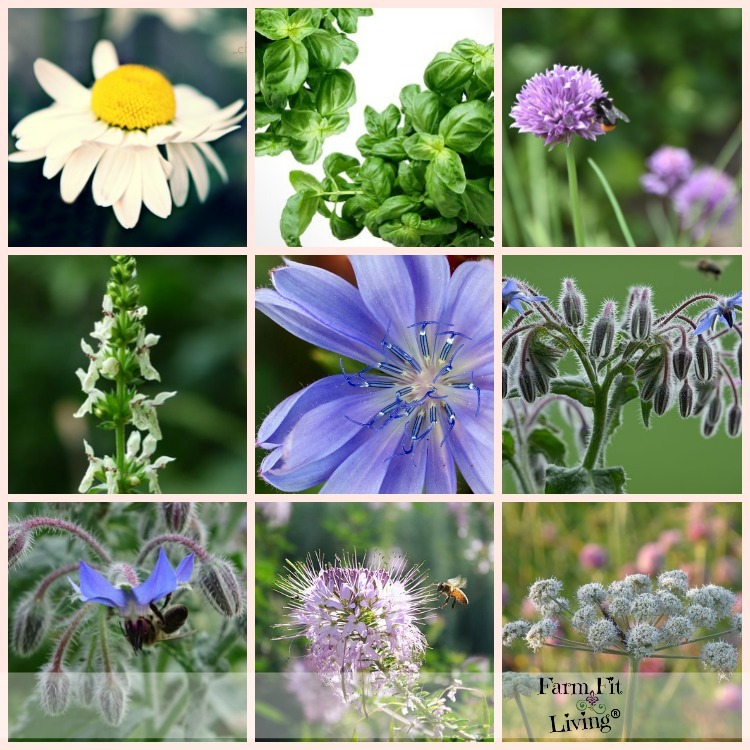 It surprised me to learn that I had always been around and helped grow these bee-friendly herbs. And you might have as well and not even known! Lambs Ear – This herb is just like it sounds. A soft, fuzzy green leafed plant that is just soft to the touch. Historically, lambs ear was used as a wound dressing on the battlefields. Not only do the leaves absorb blood and help it clot quickly, but it’s also full of antibacterial, antiseptic and anti-inflammatory properties. Wow. I’ll never have to buy ointment or bandaids again. It can also be eaten as a salad or steamed as a green. Some people also drink Lambs Ear Tea for antibiotic benefits. Lavender – I just love lavender and so do bees! Bees love the colors and fragrance of these bee-friendly herbs that keep them coming back. Lavender is widely used as medicine, to flavor food and drinks, fragrance and popular essential oils. Medicinally, lavender has been known to reduce stress, improve moods, get a restful night sleep, skin irritation, prevent infections, reduce inflamation, and soothe bloating. While lavender can be difficult to grow and propogate, you might do a Google Search for Lavender farms in your area to start growing this wonderful herb. If you can, I definitely suggest adding lavender to your list of planting herbs that attract bees. LemonBalm – A member of the mint family, lemon balm is popular with bees for it’s lemony scent. No doubt lemon balm is used as a flavoring agent in extracts, oils and teas, but it’s also widely used to add scent to wreaths and bouquets. Medicinally, lemon balm has been known to improve digestive problems, pain, mental disorders and has calming effects. Lemongrass – Similar scent to lemon balm, lemon grass is a grass plant. It’s used widely in aroma therapy and in fragrances for soaps and cosmetics. People also consume it in teas. Lemon grass is used in treating digestive tract issues and pains by rubbing the grass directly on the skin or drinking it infused in tea or water. Mint – The beautiful violet flowers of mint are what makes these planting herbs that attract bees. We also love mint for its flavorful leaves that we consume regularly. Leaves are used to flavor meats as well as beverages and jellies. A few things to keep in mind: Mint can be invasive, so growing them in containers will help with that. I have experienced this first hand. Also, spearmints and peppermints have been known to be herbs that repel bees. So, you might steer clear of those particular varieties of mints if your goal is planting herbs that attract bees to your property. Oregano – We love oregano and we know that it’s used widely to flavor our food. We also know it has a lot of medicinal properties for us as well. Bees love oregano because it’s such an aromatic herb. They love the fragrance of oregano just as we do. And that’s why planting herbs that attract bees, such as oregano, can help us thrive as well. We love that it helps with respiratory, gastrointestinal and urinary tract ailments. We also love the flavoring it provides in our food. Italian food, such as pizza, pasta sauces, soups and meat dishes can not be made without oregano. Parsley – A popular one of those popular bee-friendly herbs used to garnish our plates at fancy restaurants, parsley is also good to eat. It’s super nutritious and it contains vitamins C, K and A as well as folate and iron. It also has some medicinal properties. The leaves, seed and roots are used to help treat urinary tract infections, kidney stones, gastrointestinal issues and skin irritants. It can be used to help soothe insect bites and chapped skin and bruises. It’s also known to be an aphrodisiac like Summer Savory or Chocolate. What’s not to love about planting herbs that attract bees AND have healthful benefits for us as well? Sage – Not only is this one special because it’s the name of my precious Beagle dog. But it’s blue-purple flowers attract bees. Traditionally, Sage has been used for cooking. It has a lot of healthy benefits to it, including antioxidant and anti-inflammatory properties. It’s also been said to reduce the progress of Alzheimer’s Disease. If you have trouble remembering things, you might want to try adding sage in to your daily diet. Need I say more? I’ll be planting these bee-friendly herbs in my garden more and more. We all need more love in our life. Well, it’s delicious and tastes a lot like thyme’s peppery taste. But it’s also used medicinally to help with bee stings. Now, what about the love part? Old history claims summer savory to be associated with old love potions. It’s known to be an aphrodisiac just as chocolate is. So, if you’re looking for love, you might be interested in trying summer savory. Tansy – Bright yellow flowers that bees love adorn this beautiful perennial herb plant. However, it has a bitter taste. So I would advise against consuming it in your foods. But, of course, it has other benefits. It’s bitterness repels mosquitoes and flies. It’s also used as a preserving herb for meat and also for bodies before burial. Finally, this mint smelling herb has been known for a long time as the bible leaf. This means it has been a great bookmark for books, including the bible. Hey, I guess everyone needs a book mark. It’s an important job! Thyme – Here’s another one I enjoy planting herbs that attract bees to my garden. I know thyme has been grown a long time (no pun intended). I found a lot of historical evidence of uses for thyme that are kind of cool. For example, thyme was historically used as an incense as burnt offerings. It’s also been historically associated with courage, used by soldiers before battle. Knights would bathe in thyme water to absorb the liquid courage. I wonder if they would bathe after battle as well, since thyme has antiseptic properties. Yes, thyme has been known to be a great medicinal herb as well. It speeds up the healing process of infection and it fights respiratory ailments. It’s also antifungal. And, of course, we eat it. I cook with it in a lot of my recipes and I’m sure you do as well. Flowers and smell attract bees, which is just another reason to have these bee-friendly herbs growing in your herb garden. Woundworts – These bee-friendly herbs are loaded with nectar for bees. They flock to it but it’s also good for us as well. It’s an edible herb but it’s also a healing herb that has antispasmodic properties. It’s a great source of natural treatment for gout, cramps and aching joints. It has also been known to lift spirits and make people feel better. Umm…yep. I’m sold. Who doesn’t want to have their spirits lifted and feel happier? I’ll be planting herbs that attract bees more and more from this list. Well, that’s it. There are some herbs that bees don’t like that you may not want to grow. So, let’s talk about these three herbs that repel bees. Since we are social beings, there are times when we want to have people over who may not appreciate our honeybees in the same way we do. They might be allergic to bees or even bee-friendly herbs. There are certain herbs that do not attract bees. For these times, there are just a few plant oils that are claimed to be herbs that repel bees. I say “claim” because I don’t believe they will repel them away for very long or at all after a while. You just have to replace fresh oil or scent to keep them potent enough to keep them away. Spearmint or Peppermint – Sprinkle Oil around your gathering area. Eucalyptus – Sprinkle the Oil or burn candles containing oil from these herbs that repel bees around your gathering area. Citronella – Burning a citronella candle will repel bees for a time. When looking around for more information about these herbs that repel bees, I found articles stating that these herbs and plants CAN attract bees to them. I suppose it depends on what your bees have adapted to overtime. So, while they are worth trying if you want to keep bees from coming near your swimming pool area or bar-b-que backyard, I don’t guarantee the success of these herbs that repel bees for long. If you’re interested in planting some of these herbs, you’re going to want to check out my free ebook: How to plant herbs that attract bees. Click here for that Herbs for Bees eBook to be delivered to your inbox. I hope you gained the valuable information you needed for planting herbs that attract bees to your gardens. I know they will appreciate it, too. Honeybees are so thoughtful and considerate of us providing them with beautiful and fragrant bee-friendly herbs for them to enjoy. And we can enjoy them as well, both medicinally and in the foods and drinks we love. 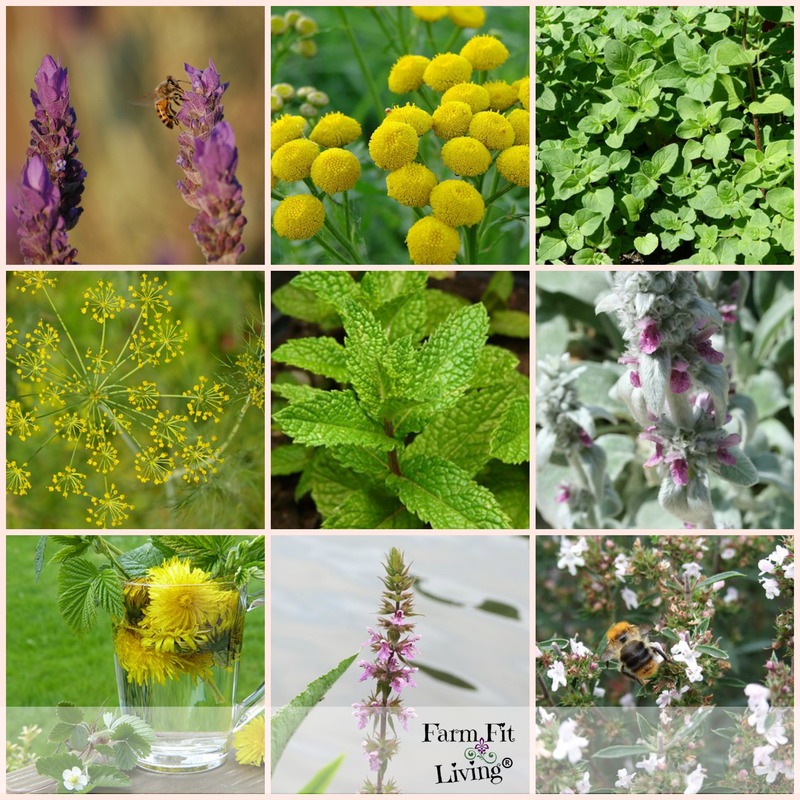 Enter your email and receive my free eBook filled with information about 25 planting herbs that attract bees (as well as some herbs that repel bees). Success! Now check your email to confirm that you really wanted a book about the Top 25 Herbs for Bees.